The violent left-wing group refusefacism.org is planning to start protests on Saturday until President Trump is removed from office. 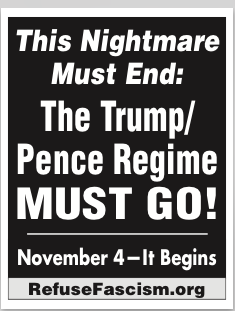 The effort asserts that “The Trump/Pence Regime is a Fascist Regime.” Organizers claim Trump’s presidency is illegitimate. The effort includes a broad coalition of groups such as the Revolutionary Communist Party. Then all refugees. Then women. Then Black and Latino people. LGBTQ persons. 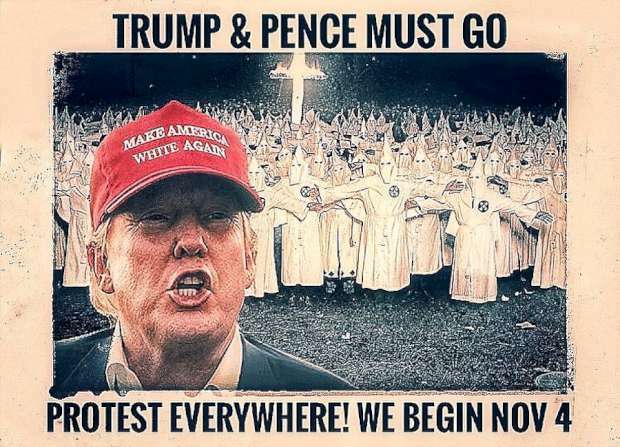 The environment, and anyone who doesn’t conform or submit to their vision and plan for a nation cohered around white supremacy and a political form of Christian fundamentalism, that should rightly be called Christian Fascism. Protests are planned in nineteen cities, including New York and Washington. They’re almost all Democratic cities, located in mostly blue states. Some speculate the group avoided red areas of the country due to higher percentages of gun owners. Also, the police are less likely in red areas to look the other way at violence. Remove Trump From Office, But How? Zee is fully aware the mainstream media leans to the left. He intends to enlist their help. He says, “CNN, MSNBC, The New York Times, and The Washington Post ‘must go all out’ to “hound the enemy. '” The group cleverly took out a full-page ad in The New York Times that almost looks like part of the actual paper.